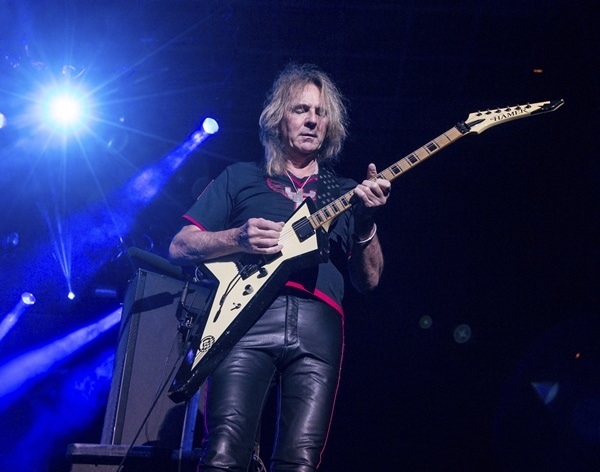 London (AP) – Parkinson’s disease has forced legendary guitarist Glenn Tipton to drop out of the upcoming Judas Priest tour. The British rockers say Tipton is stepping down from touring due to the ailment, which began to afflict him a decade ago. In a statement the band said Tipton can still play some of their less-challenging songs, but he insisted that a replacement be named for the tour. Tipton will be replaced on the band’s “Firepower” tour by Andy Sneap, a veteran heavy metal producer, and the guitarist for the British band Hell. Tipton was the lone remaining original member of Judas Priest’s twin-lead guitar attack that powered solos on tracks including “Electric Eye” and “Hell Bent For Leather.” Guitarist Richie Faulkner replaced the other founding guitarist, K.K. Downing, in 2011. Last month, Neil Diamond announced his retirement from touring, also citing Parkinson’s.